I found these notebooks (with the pen!) at Michael's in the dollar aisle...that's right, it only cost a dollar! They had a bunch of colors to pick from too. I knew I wanted to use some of the papers and ribbon from my Father's Day Key Ingredients so I picked up an orangey-red colored book. Here's what the notebook looked like when I bought it. I turned it to accommodate the toolbelt image from the Boys Will Be Boys set. The pages on the inside of the book are completely blank without any lines, so it totally worked out to turn it on its side. It was super easy (and fast) to make. I just cut a piece of the plaid DP to 4-3/8" x 2-7/8" as the "base" and then decorated it like a card. The white deckled rectangle is up on 1/16" foam tape and so is the sentiment on the double-ended tag. Taylor has both of these Spellbinders products in her store! I made the "Honey Do Book" sentiment with my JustRite Lowercase Times New Roman Font, another product in the Taylored Expressions store! I love one-stop shopping! While you're here today, don't forget to sign up for the Taylored Expressions Newsletter! The sign-up window is over there in the sidebar. Thanks for stopping by today! We love when you do! Denise, this turned out GREAT girl!!! How clever is this!! And for just $1 you've turned it into a priceless gift! Love the DP and the great job of coloring Denise. Totally cute idea - Denise!!! This is a great idea, and your coloring is so fabulous!! Wonderful project!! This is simply FANTASTIC Denise! Totally AWESOME idea (who doesn't need a list like that???) and BEAUTIFUL execution! LOVE this girl! Great project, Denise!! Love that tool belt!! This is just the cutest. 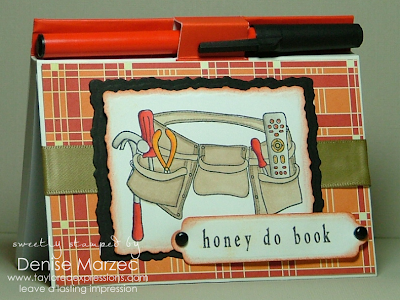 I love the tool belt and what a great idea for one of these notepads.I just love the dollar bins. What a fabulous idea Denise! I love it! This is so cute and easy Denise! what a fun idea to alter this note book. I love that papers and that great tool belt stamp! !